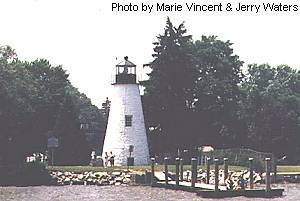 Concord Point Lighthouse – Chesapeake Chapter U.S.L.H.S. Concord Point Light is a 36-foot tower that was built in 1827. It is the second oldest tower lighthouse on the Chesapeake Bay and the oldest continuous lighthouse in Maryland. The tower is built at the point where the Susquehanna River meets the tidal flow of the Chesapeake Bay and navigation is very hazardous around this area. John Donohoo was the designated builder and also built the keeper’s dwelling (also known as the O’Neill House) situated across the street. The lighthouse is constructed of Port Deposit granite. The walls are 31″ thick at the base and narrow to 18″ at the parapet. The lantern was originally lit with 9 whale oil lamps with 16-inch tin reflectors. In 1854 a sixth-order Fresnel lens was installed. This was later upgraded to a fifth-order Fresnel lens. The lighthouse was automated in 1920. The O’Neill family has served as keepers at Concord Point from 1827 to the mid-1900s. The first O’Neill, John, defended the site of the lighthouse during the War of 1812. Local documents describe the lighthouse area as being “seriously blighted” by 1924, and apparently remained that way for many years. The Coast Guard decommissioned the lighthouse in 1975, soon after that the lens was stolen. An extensive restoration began in 1979, and is ongoing, with plans to turn the old keeper’s dwelling into a museum. The lighthouse is maintained by The Friends of Concord Point Lighthouse. The lighthouse is located in the town of Havre de Grace, Maryland. The tower is open to visitors Saturdays, Sundays and holidays from 1:00 p.m. until 5 p.m. May-October. The grounds are open year-round. Take Exit 89, Rt. 155 (Level Road) and go east about 2 miles to Rt. 40 (Pulaski Highway). Bear right onto Rt. 40, go 0.4 mi. to traffic light. Bear left at traffic light onto Otsego Street (Rt. 7), follow 0.5 mi. to end of Otsego at railroad underpass. Turn right onto Union Avenue, proceed 0.9 mi. to Lafayette Street. Turn left on Lafayette. Lighthouse is directly ahead, parking on street.